Linux is an operating system based on UNIX. First Linux was introduced by Linus Torvalds. It is based on the Linux Kernel and can run on different hardware platforms manufactured by Intel, MIPS, HP, IBM, SPARC and Motorola etc. Question: What is the difference between UNIX and LINUX? Unix originally began as a propriety operating system from Bell Laboratories, which later on leads to different commercial versions. Linux is free, open source and intended as a non-propriety operating system. BASH is short for Bourne Again SHell. Bash is the opensource version of the Bourne shell distributed with Linux and GNU operating systems. Question: What is Linux Kernel? 1. Manage hardware resources for the user. 2. Provide an interface for user-level interaction. LILO is a boot loader for Linux. Question: What is a swap space? Swap space is space used by Linux to temporarily hold some programs that are running. Question: What is the basic difference between BASH and DOS? 1. BASH are case sensitive while DOS commands are not. 2. In BASH, / character is a directory separator and \ acts as an escape character. In DOS, \ character is the directory separator and / serves as a command argument delimiter. 3. DOS follows a naming convention in which 8 character file name followed by a dot and 3 character for the extension. BASH does not follows such convention. Question: Describe the root account? The root account is administrator account, and have you full control of the system. Full form of CLI is Command Line Interface. Full form of GUI is Graphical User Interface. GUI makes uses images, icon and decorated for user to easily communicating with the computer. Question: What are symbolic links? Symbolic links act similarly to shortcuts in Windows. Question: What are the kinds of permissions under Linux? Question: How do you change permissions under Linux? Use + symbol to add permission. Use – symbol to deny permission. Use u symbol for User. Use g symbol for Group. Use a symbol for all. Use r symbol for Read. Use w symbol for write. Use x symbol for Execute. Question: What are hard links? Hard links point directly to the physical file on disk. Question: What is the maximum length for a filename under Linux? 255 characters (Excluding file path). Question: What are file-names that are preceded by a dot? Daemons are services that provide functions that may not be available under the base operating system. Question: What is the SMTP? Full form of SMTP is Simple Mail Transfer Protocol. SMTP is the Internet protocol for electronic mail transmission. Technically SMTP protocol is used to sending and receiving email From one server to another server. Samba is an Open Source/Free Software that provides seamless file and print services to SMB/CIFS clients. Question: What Samba service do? Samba is interoperability between Linux/Unix servers and Windows-based clients. So that Linux machines can connect to Microsoft network resources. Question: In which language Samba is written? Question: What is name of Service used with NFS to provide remote file access for UNIX systems? Question: Which service provides searching capabilities on an intranet or domain? Full form of MTA is Message Transfer Agent. MTA is software that transfers electronic mail messages from one computer to another using a client–server application architecture. MTA implements both side Client Side and Server Side. Question: Which port should you open in your host firewall to run web server? Default port is 80 and 443. Question: Which ports should you open in host firewall for an email server? POP3 e-mail protocol use 110 port. SMTP e-mail protocol use 25 port. IMAP e-mail protocol use 143 port. Question: Which IP addressing should you use for Server? Question: Which IP address should you use for client desktop? For client you can use both static and dynamic. Question: What command is used to remove files? Question: What command is used to remove directory? you have to empty the directory before remove. 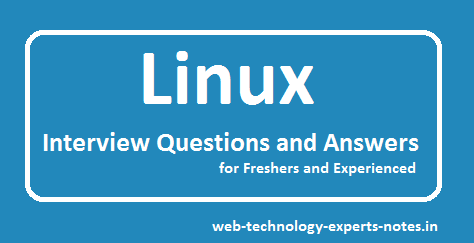 Question: What is the core of Linux Operating System? Kernel is the core of Linux Operating System. Question: What is Shell in Linux? Shell is a command Line Interpreter in Linux. Terminal is a command Line Interface. Question: Is it legal to edit Linux Kernel? Kernel is released under General Public Licence (GPL), So any one can edit as per requirement. Question: Is Linux Operating system Virus free? Linux is known to have least number of Viruses. Question: What is grep command? Question: How do you terminate an ongoing process? How to add user in linux terminal OR change the password of user.